Tobacco use is a serious public health problem in the South East Asia Region where use of both smoking and smokeless form of tobacco is widely prevalent. The region has almost one quarter of the global population and about one quarter of all smokers in the world. Smoking among men is high in the Region and women usually take to chewing tobacco. The prevalence across countries varies significantly with smoking among adult men ranges from 24.3% (India) to 63.1% (Indonesia) and among adult women from 0.4% (Sri Lanka) to 15% (Myanmar and Nepal). 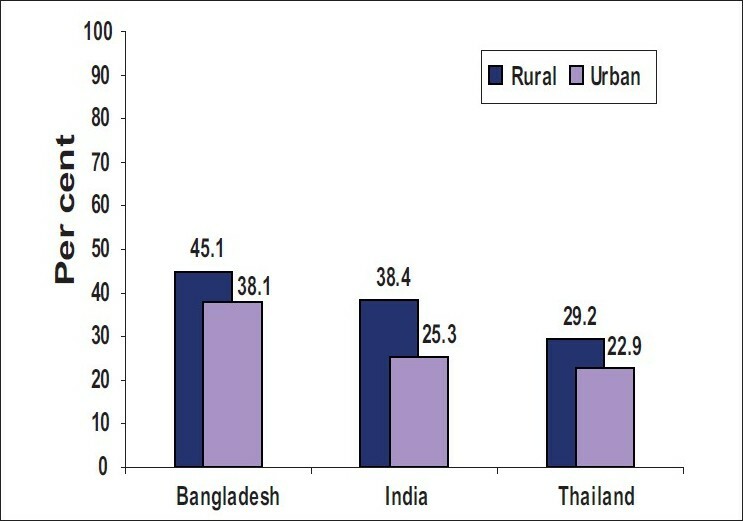 The prevalence of smokeless tobacco use among men varies from 1.3% (Thailand) to 31.8% (Myanmar), while for women it is from 4.6% (Nepal) to 27.9% (Bangladesh). About 55% of total deaths are due to Non communicable diseases (NCDs) with 53.4% among females with highest in Maldives (79.4%) and low in Timor-Leste (34.4%). Premature mortality due to NCDs in young age is high in the region with 60.7% deaths in Timor Leste and 60.6% deaths in Bangladesh occurring below the age of 70 years. Age standardized death rate per 100,000 populations due to NCDs ranges from 793 (Bhutan) and 612 (Maldives) among males and 654 (Bhutan) and 461 (Sri Lanka) among females respectively. 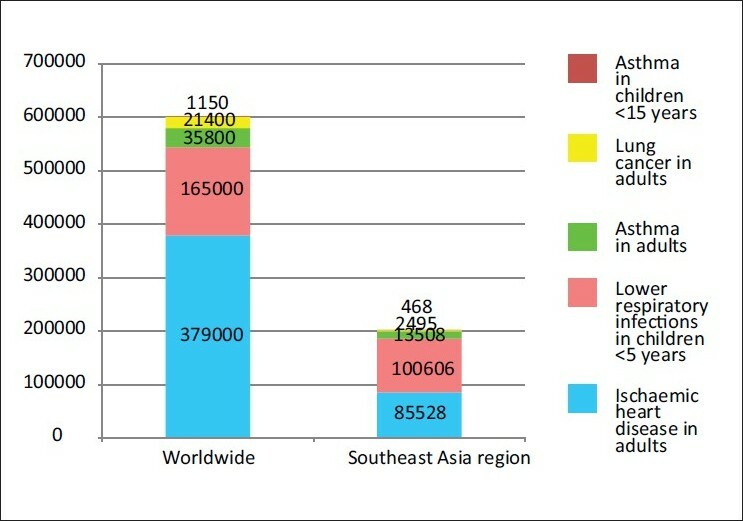 Out of 5.1 millions tobacco attributable deaths in the world, more than 1 million are in South East Asia Region (SEAR) countries. Reducing tobacco use is one of the best buys along with harmful use of alcohol, salt reduction and promotion of physical activity for preventing NCDs. Integrating tobacco control with broader population services in the health system framework is crucial to achieve control of NCDs and sustain development in SEAR countries. This paper examines the social, cultural, economic and legal dimensions of tobacco control in the South-East Asia Region in a holistic view through the review of findings from various studies on prevalence, tobacco economics, poverty alleviation, women and tobacco and tobacco control laws and regulations. Methods were Literature review of peer reviewed publications, country reports, WHO publications, and reports of national and international meetings on tobacco and findings from national level surveys and studies. Tobacco use has been a social and cultural part of the people of South-East Asia Region. Survey findings show that 30% to 60% of men and 1.8% to 15.6% of women in the Region use one or the other forms of tobacco products. The complex nature of tobacco use with both smoking and smokeless forms is a major challenge for implementing tobacco control measures. Prevalence of tobacco use is high among the poor and the illiterate. It is higher among males than females but studies show a rising trend among girls and women due to intensive marketing of tobacco products by the tobacco industry. Tobacco users spend a huge percent of their income on tobacco which deprives them and their families of proper nutrition, good education and health care. Some studies of the Region show that cost of treatment of diseases attributable to tobacco use was more than double the revenue that governments received from tobacco taxation. Another challenge the Region faces is the application of uniform tax to all forms of tobacco, which will reduce not only the availability of tobacco products in the market but also control people switching over to cheaper tobacco products. Ten out of eleven countries are Parties to the WHO Framework Convention on Tobacco Control and nine countries have tobacco control legislation. Enforcement of control measures is weak, particularly in areas such as smoke-free environments, advertisement at the point of sale and sale of tobacco to minors. Socio-cultural acceptance of tobacco use is still a major challenge in tobacco control efforts for the governments and stakeholders in the South-East Asia Region. The myth that chewing tobacco is less harmful than smoking tobacco needs to be addressed with public awareness campaigns. Advocacy on the integration of tobacco control with poverty alleviation campaigns and development programs is urgently required. Law enforcement is a critical area to be strengthened and supported by WHO and the civil society organizations working in the area of tobacco control. Background: This paper examines the prevalence of current tobacco use among youth and adults in selected member countries of the South-East Asia Region using the data from school and household-based surveys included in the Global Tobacco Surveillance System. Materials and Methods: Global Youth Tobacco Survey (GYTS) data (years 2007-2009) were used to examine current tobacco use prevalence among youth, whereas Global Adult Tobacco Survey (GATS) data (years 2009-2010) were used to examine the prevalence among adults. GYTS is a school-based survey of students aged 13-15, using a two-stage cluster sample design, and GATS is a household survey of adults age 15 and above using a multi-stage stratified cluster design. Both surveys used a standard protocol for the questionnaire, data collection and analysis. Results: Prevalence of current tobacco use among students aged 13-15 varied from 5.9% in Bangladesh to 56.5% in Timor-Leste, and the prevalence among adults aged 15 and above was highest in Bangladesh (43.3%), followed by India (34.6%) and Thailand (27.2%). Reported prevalence was significantly higher among males than females for adults and youth in all countries except Bangladesh, Sri Lanka and Timor-Leste. 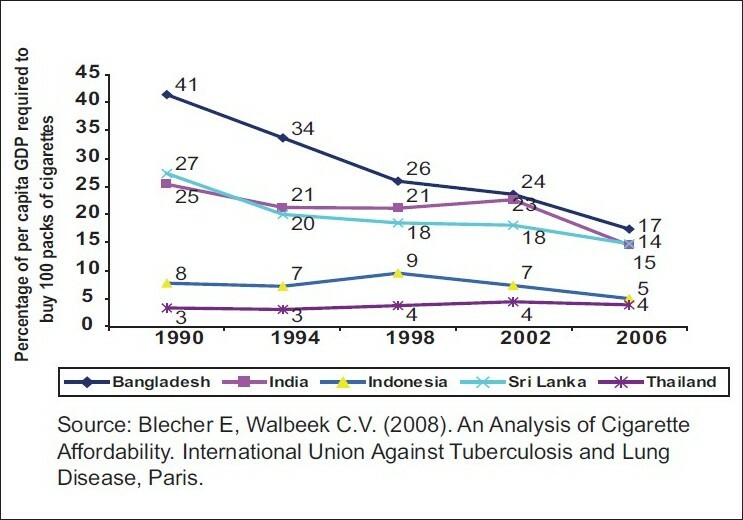 Current use of tobacco other than manufactured cigarettes was notably higher than current cigarette smoking among youth aged 13-15 years in most countries of the Region, while the same was observed among adults in Bangladesh, India and Thailand, with most women in those countries, and 49% of men in India, using smokeless tobacco. Conclusion: Tobacco use among youth and adults in member countries of the region is high and the pattern of tobacco consumption is complex. Tobacco products other than cigarettes are commonly used by youth and adults, as those products are relatively cheaper than cigarettes and affordable for almost all segments of the population. As a result, use of locally produced smoked and smokeless tobacco products is high in the region. Generating reliable data on tobacco use and key tobacco control measures at regular intervals is essential to better understand and respond with effective tobacco control intervention. India is at a crucial juncture relating to tobacco control and implementing the recommendations of the WHO FCTC. Tobacco consumption in the country remains alarmingly high in urban as well as rural areas. Smokeless tobacco consumption is very popular among larger masses, including the youth. Cigarette smoking has declined, but bidi use has increased concomitantly. Youth continue to be lured to initiate tobacco consumption through efficient marketing strategies of tobacco companies. The epidemiology of tobacco consumption is markedly varied across the country, with high rates in 15 States. Progress has been made towards tobacco control by the enactment of laws and regulations and the National Tobacco Control Program. Strengthening their implementation and enforcement is the biggest challenge and requires resource inputs. Evidence generation and its translation and utilisation for policy interventions would be useful. The birth of the WHO Framework Convention on Tobacco Control (WHO FCTC) took place in response to the global tobacco epidemic and it became the most important global tobacco control instrument. Duly recognizing tobacco use as an important public health problem and in the wake of rising prevalence of and mortality related to tobacco use, almost all Member States of the South-East Asia Region signed and ratified the WHO FCTC. Following the ratification, Member countries have enacted comprehensive national tobacco control laws and regulations. Most countries have covered some important provisions, such as tax and price measures, smoke-free places, health warnings, a ban on tobacco advertising and promotion, and a ban on tobacco sales to minors. In spite of innumerable constraints and challenges, particularly human, infrastructural and financial resources, Member countries have been doing their best to enforce those legislations and regulations as effectively as possible. In order to educate the general public on the harmful effects of tobacco, mass health campaigns have been organized which are being continued and sustained. However, some of the important areas that need attention in due course of time are tax raises, illicit trade, tobacco industry interference and alternate cropping systems. All Member States in the Region are striving harder to achieving the goals and provisions of the Framework Convention through actively engaging all relevant sectors and addressing the tobacco issue holistically, and thus protecting the present and future generations from the devastating health, social, economic and environmental consequences of tobacco consumption and exposure to tobacco smoke. Exposure to secondhand smoke (SHS) causes an estimated 5% of the global burden of disease, slightly higher than the burden from direct use of tobacco. This review highlights the urgent need to address this ignored public health issue by presenting the evidence and impact of SHS on those exposed using global studies including those from the South-East Asia Region. The burden of morbidity from SHS exposure is higher in low-income countries in Southeast Asia region compared to the rest of the world. SHS exposure affects those most vulnerable, especially women and children. While several countries in the region have enacted legislation which offer protection to those exposed to SHS, most measures are partial and inadequate. As a result, implementation and compliance at national and sub-national level within the countries of the Southeast Asia region is variable. Governments must ensure that legislation mandates comprehensive smoke-free environments in order to provide public health benefit which offers universal protection to everyone and everywhere. Where comprehensive legislation exists, stringent implementation and enforcement, along with awareness building, education and monitoring through regular compliance studies must be done to sustain smokefree status of public places within jurisdictions. Smokeless tobacco use is on the upswing in some parts of the world, including parts of SEAR. It is therefore important to monitor this problem and understand the possible consequences on public health. Material for this review was obtained from documents and data of the World Health Organization, co-authors, colleagues, and searches on key words in PubMed and on Google. Smokeless tobacco use in SEAR, as betel quid with tobacco, declined with increased marketing of cigarettes from the early twentieth century. Smokeless tobacco use began to increase in the 1970s in South Asia, with the marketing of new products made from areca nut and tobacco and convenient packaging. As a consequence, oral precancerous conditions and cancer incidence in young adults have increased significantly. Thailand's successful policies in reducing betel quid use through school health education from the 1920s and in preventing imports of smokeless tobacco products from 1992 are worth emulating by many SEAR countries. India, the largest manufacturing country of smokeless tobacco in the Region, is considering ways to regulate its production. Best practices require the simultaneous control of smokeless and smoking forms of tobacco. Governments in SEAR would do well to adopt strong measures now to control this problem. Objective: To examine exposure to second-hand smoke (SHS) at home, in workplace, and in various public places in Bangladesh. 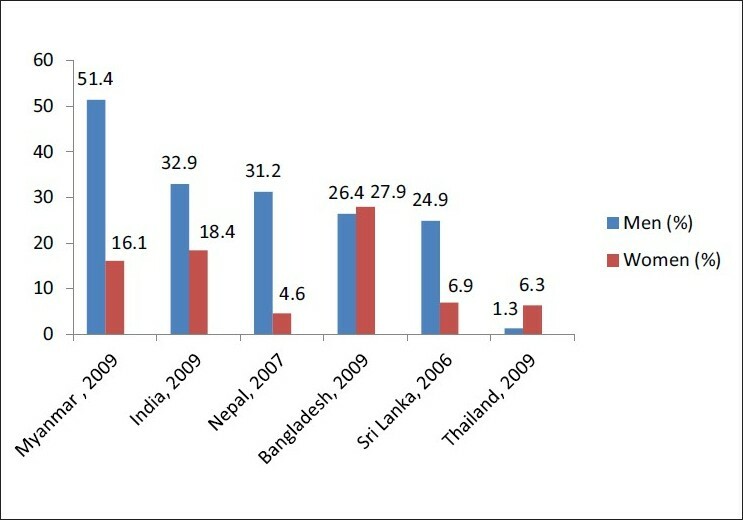 Materials and Methods: Data from 2009 Global Adult Tobacco Survey (GATS) conducted in Bangladesh was analyzed. The data consists of 9,629 respondents from a nationally representative multi-stage probability sample of adults aged 15 years and above. 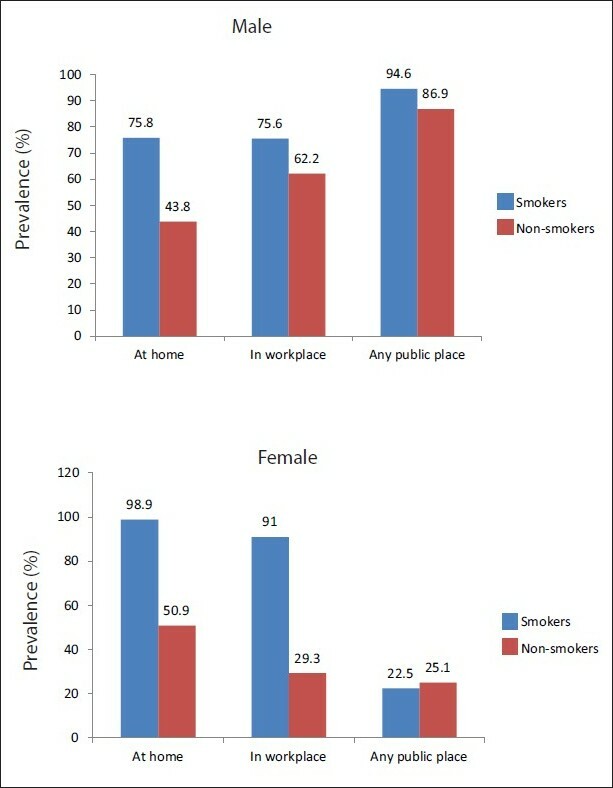 Exposure to second-hand smoke was defined as respondents who reported being exposed to tobacco smoke in the following locations: Indoor workplaces, homes, government building or office, health care facilities, public transportation, schools, universities, restaurants, and cafes, coffee shops or tea houses. Exposure to tobacco smoke in these places was examined by gender across various socioeconomic and demographic sub-groups that include age, residence, education and wealth index using SPSS 17.0 for complex samples. Results: The study shows high prevalence of SHS exposure at home and in workplace and in public places. Exposure to SHS among adults was reported high at home (54.9%) (male-58.2% and female-51.7%), in workplace (63%) (male-67.8% and female-30.4%), and in any public place (57.8%) (male-90.4% and female-25.1%) 30 days preceding the survey. Among the public places examined exposure was low in the educational institutions (schools-4.3%) and health care facilities (5.8%); however, exposure was high in public transportation (26.3%), and restaurants (27.6%). SHS exposure levels at home, in workplace and public places were varied widely across various socioeconomic and demographic sub-groups. Conclusions: Exposure was reported high in settings having partial ban as compared to settings having a complete ban. Following the WHO FCTC and MPOWER measures, strengthening smoke-free legislation may further the efforts in Bangladesh towards creating and enforcing 100% smoke-free areas and educating the public about the dangers of SHS. Combining these efforts can have a complementary effect on protecting the people from hazardous effect of SHS as well as reducing the social acceptance of smoking both at home and in public and workplaces. Ongoing surveillance in Bangladesh is necessary to measure progress towards monitoring SHS exposure. Tobacco use is a major public health challenge in India with 275 million adults consuming different tobacco products. 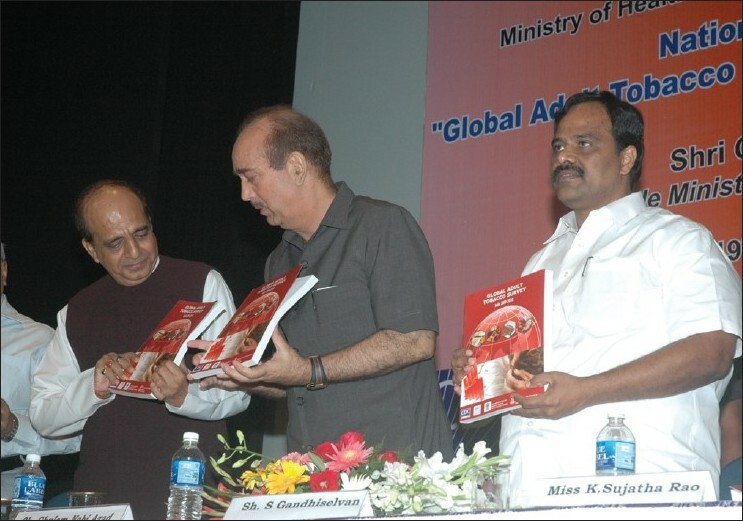 Government of India has taken various initiatives for tobacco control in the country. Besides enacting comprehensive tobacco control legislation (COTPA, 2003), India was among the first few countries to ratify WHO the Framework Convention on Tobacco Control (WHO FCTC) in 2004. The National Tobacco Control Programme was piloted during the 11 th Five Year Plan which is under implementation in 42 districts of 21 states in the country. The advocacy for tobacco control by the civil society and community led initiatives has acted in synergy with tobacco control policies of the Government. Although different levels of success have been achieved by the states, non prioritization of tobacco control at the sub national level still exists and effective implementation of tobacco control policies remains largely a challenge. This review of legislation, obstacles faced, and challenges to be met, outlines present tobacco control lessons learnt in Thailand. A review of over twenty years of tobacco control experience in Thailand is provided in seven areas including policy formulation and the role of civil society, as well as in essential WHO Framework Convention on Tobacco Control areas. A descriptive, historical review shows how stakeholders, policies and resources were mobilized in Thailand, and what lessons resource-challenged countries might use from the Thai experience. Smoke-free legislation is gaining popularity; however, it must accompany effective implementation to protect people from secondhand smoke (SHS) which causes 600,000 deaths annually. Increasing numbers of smoke-free cities in the world indicate that municipalities have an important role in promoting smoke-free environments. The objectives were to describe the local initiative to promote smoke-free environments and identify the key factors that contributed to the process. 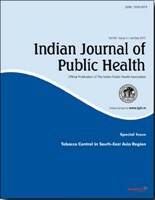 Observations were based on a case study on the municipal smoke-free initiatives in Chandigarh and Chennai, India. India adopted the Cigarette and Other Tobacco Products Act in 2003, the first national tobacco control law including smoke-free provisions. In an effort to enforce the Act at the local level, a civil society organization in Chandigarh initiated activities urging the city to support the implementation of the provisions of the Act which led to the initiation of city-wide law enforcement. 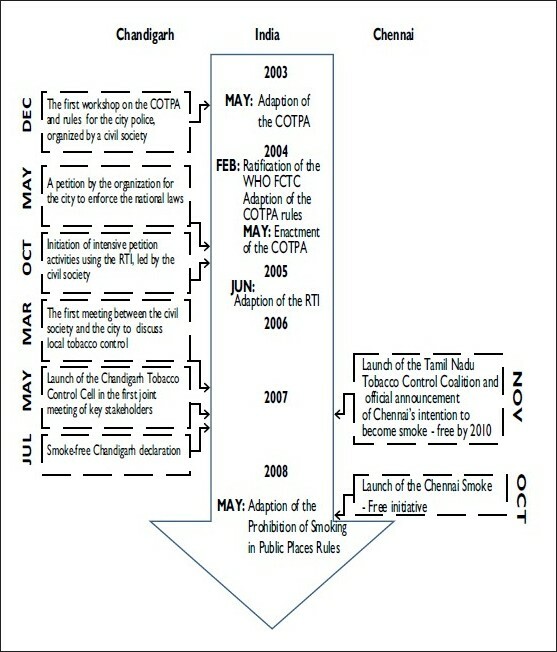 After the smoke-free declaration of Chandigarh in 2007, Chennai also initiated a smoke-free intervention led by civil society in 2008, following the strategies used in Chandigarh. These experiences resonate with other cases in Asian cities, such as Jakarta, Davao, and Kanagawa as well as cities in other areas of the world including Mexico City, New York City, Mecca and Medina. The cases of Chandigarh and Chennai demonstrate that civil society can make a great contribution to the enforcement of smoke-free laws in cities, and that cities can learn from their peers to protect people from SHS.